To Cite: Sadeghi F, Salehi-Vaziri M, Almasi-Hashiani A, Gholami-Fesharaki M, Pakzad R, et al. Prevalence of Hepatitis C Virus Genotypes Among Patients in Countries of the Eastern Mediterranean Regional Office of WHO (EMRO): A Systematic Review and Meta-Analysis, Hepat Mon. 2016 ; 16(4):e35558. doi: 10.5812/hepatmon.35558. Context: Hepatitis C virus (HCV) infection is a major global public health issue. The Eastern Mediterranean regional office (EMRO) of the world health organization (WHO) seems to have one of the highest prevalence rates worldwide, with at least 21.3 million HCV-infected patients. Objectives: The aim of the present study was to review systematically all epidemiological data related to the prevalence of HCV genotypes in infected patients in EMRO countries. Data Sources: A systematic search was conducted of peer-reviewed journals indexed in electronic databases (PubMed, Scopus, ISI, PakMediNet, and IMEMR, and Persian-specific databases including SID, Iran Medex, and MagIran). Study Selection: A systematic search was performed with temporal limits (papers published between January 2000 up to June 2015), regarding the prevalence and distribution of HCV genotypes in EMRO countries. Data Extraction: The prevalence rates of HCV genotypes were pooled by metan command in Stata 14. Statistical heterogeneity was explored using the I-square at the 5% significance level. Publication bias was assessed, graphically and statistically, by funnel plot and Begg and Egger tests. Results: A total of 563 records were identified through the electronic search. Of these records, 134 studies comprising 67681 HCV-infected individuals were included in the meta-analysis. In Iran, subtype 1a was the predominant subtype with a rate of 42% (95% CI, 39 - 46), followed by subtype 3a, 35% (95% CI, 31 - 38). In Pakistan, Subtype 3a was the most common subtype with a rate of 56% (95% CI, 49 - 62), followed by subtype 3b, 10% (95% CI, 7 - 12). In Saudi Arabia and Egypt, genotype 4 was the most prevalent genotype with a rate of 65% (95% CI, 59 - 72) and 69% (95% CI, 36 - 100) respectively. In Tunisia and Morocco, subtype 1b was the most common subtype with a rate of 69% (95% CI, 50 - 88) and 32% (95% CI, 7 - 56) respectively. Conclusions: The genotype distribution of HCV takes diverse patterns in EMRO countries. 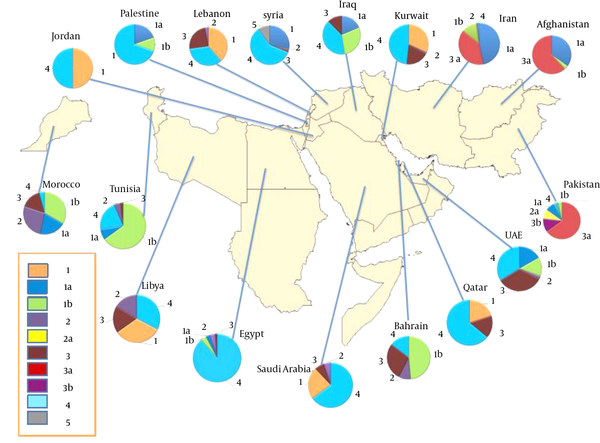 Genotypes 1 and 3 were predominant in Iran and Pakistan, while genotype 4 and 1 were the most common genotypes in the Middle East Arab countries and North African Arab countries. Understanding the genotypes of HCV can help policy makers in designing good strategies for treatment. Hepatitis C virus (HCV) infection is a major global public health issue (1, 2). It is estimated that about 3% of the world’s population remains chronically infected with HCV, equaling almost 170 million individuals (3). Long-term chronic HCV infection can eventually lead to end-stage liver disease, cirrhosis, and hepatocellular carcinoma (4). Countries in the eastern Mediterranean regional office (EMRO) of the world health organization (WHO) seem to have one of the highest prevalence rates worldwide, with at least 21.3 million HCV-infected individuals (5). Genetic variability is a distinctive feature of HCV, and viral sequences are currently classified into seven different genotypes and more than 67 subtypes (6). Viral genotypes may differ from each other in terms of response to standard antiviral therapy and geographical distribution (7, 8). Response rates to the standard treatment protocol of pegIFNα-2a and ribavirin are higher for patients infected with HCV genotypes 2 and 3 than for those with genotype 1 (8). The standard treatment regimen for chronic HCV infection can cost in excess of 22000 USD (9). Considering the high cost of treatment and the limited financial resources of many of the EMRO countries, more information about HCV genotype distribution in the EMRO can help policy makers make informed decisions about better resource allocation and programming priorities. The aim of the present study was to review systematically all epidemiological data related to the prevalence of HCV genotypes in infected patients in EMRO countries. A better knowledge about HCV genotype distribution in this region can promote better treatment strategies, and may improve the management of patients with HCV infection. A systematic search was conducted of peer-reviewed journals indexed in PubMed, Scopus and ISI databases, reporting the prevalence and distribution of HCV genotypes in EMRO countries. In addition to the aforementioned databases, Persian-specific databases, including SID, Iran Medex and MagIran, the database of biomedical publications in Pakistan (PakMediNet), and the Index Medicus for the eastern Mediterranean region database (IMEMR) were also searched. The literature search was done with temporal limits (papers published between January 2000 up to June 2015) by using the following key words: hepatitis C virus or HCV, genotypes, genotype distribution, prevalence, and epidemiology. The names of EMRO countries that were added to our search strategy are as follows: Afghanistan, Bahrain, Djibouti, Egypt, Iran, Iraq, Jordan, Kuwait, Lebanon, Libya, Morocco, Oman, Pakistan, Palestine, Qatar, Saudi Arabia, Somalia, Sudan, Syria, Tunisia, United Arab Emirates, and Yemen. All published studies fulfilling the following criteria were included in our analysis:1, studies in which the sample population was enrolled from EMRO countries with temporal limits (papers published between January 2000 up to June 2015); 2, full-text articles written in the English or Persian language on the HCV genotype prevalence among patients enrolled from EMRO countries; and 3, studies in the HCV-RNA-positive patients that used viral RNA for genotyping and relied on standard genotyping methods. The exclusion criteria were as follows: 1, studies with possible errors and unclear data; 2, studies in which only serologic findings were reported; 3, studies with non-primary data; and 4, any contraries to the inclusion criteria. All relevant papers obtained through the search strategy were reviewed by two independent reviewers (F.S) (M.S-V) and non-eligible studies were excluded (Kappa coefficient: 87.91). If there was any uncertainty, it was settled by consulting the supervisor of this investigation (S.M.A). Blinding and separation of tasks were considered in selection of studies and data extraction. The following indicators were extracted from each eligible study: first author’s name, year of publication, country of sample’s origin, sample size, risk factors, gender and mean age of subjects, genotype detection method, and HCV genotypes and subtypes. The prevalence rates of HCV genotypes were pooled by the metan command in Stata software version 14 (Stata Corp, College Station, TX, USA), and forest plot was used to display graphically the effect size of all the studies, with their confidence intervals, and the results of the meta-analysis. Statistical heterogeneity was explored using the I-square at the 5% significance level. The random effect model was used for pooling the studies’ prevalence rates. Publication bias was assessed graphically and statistically by funnel plot and Begg and Egger tests (metabias and metafunnel command in Stata) (10, 11). Funnel plots are a visual tool for investigating publication bias. They are simple scatter plots of the effect size estimated from individual studies (horizontal axis) against a measure of study size (vertical axis) in which standard error is used as the measure of study size. Publication bias may lead to asymmetrical funnel plots. A total of 563 records were identified through the electronic search that reported HCV genotypes and subtypes from EMRO countries. Of these records, 349 duplicates were found and excluded. Based on screening of the remaining titles and abstracts, 158 potentially relevant manuscripts were retrieved and included for full full-text examination. We only included studies with primary data in our analysis; publications reporting the same data were considered duplicates and excluded. In addition, we excluded papers with unclear and ambiguous data. Screening of full-text studies identified 134 eligible studies for inclusion in the analysis (Figure 1). According to what we identified, no data were available from Djibouti, Oman, Somalia, and Yemen concerning prevalence of HCV genotypes and subtypes. Furthermore, only 1 study was found from Afghanistan, Palestine, Qatar, Syria, and Sudan. Finally, we found 49 studies from Iran involving 26058 subjects, 34 studies including 50407 subjects from Pakistan, 10 studies with 5270 subjects from Egypt, 6 studies with 2116 subjects from Saudi Arabia, 6 studies with 11825 subjects from Tunisia, 5 studies with 594 subjects from Iraq, 5 studies with 1680 subjects from Morocco, 3 studies with 374 subjects from Lebanon, 3 studies with 14641 subjects from Jordan, 2 studies with 264 subjects from Bahrain, 2 studies with 185 subjects from Kuwait, 2 studies with 2131 subjects from Libya, and 2 studies including 191 subjects from the United Arab Emirates. Populations investigated to estimate the prevalence of HCV genotypes and subtypes were mainly chronic-HCV-infected patients, such as people with thalassemia, hemophiliacs, hemodialysis patients, and injecting drug users. In addition, a few studies included general population groups, such as blood donors, healthy volunteers, and pregnant women. Characteristics of the included patients and the studies from the EMRO countries were shown in Appendix 1. Based on our results, genotype distribution of HCV takes diverse patterns in EMRO countries (Figure 2). According to the random-effect model, the estimated pooled prevalence of HCV genotypes and subtypes in each of the EMRO countries is listed below. In Pakistan, genotype 3 was the predominant genotype with a rate of 67% (95% CI, 62 - 71); followed by genotype 1, 8% (95% CI, 6 - 10). Subtype 3a was the most common subtype with a rate of 56% (95% CI, 49 - 62); followed by subtype 3b, 10% (95% CI, 7 - 12). Appendix 2 provides forest plots depicting pooled summary estimates of the prevalence of HCV genotypes and subtypes in Pakistan. In Iran, genotype 1 was the most prevalent genotype with a rate of 54% (95% CI, 51 - 58); followed by genotype 3, 36% (95% CI, 32 - 39). Subtype 1a was the predominant subtype with a rate of 42% (95% CI, 39 - 46); followed by subtype 3a, 35% (95% CI, 31 - 38); and subtype 1b, 11% (95% CI, 10 - 13). Appendix 3 provides forest plots depicting pooled summary estimates of the prevalence of HCV genotypes and subtypes in Iran. A study in 113 HCV-RNA-positive injection drug users in Afghanistan showed subtype 3a as dominant with a rate of 39% (95% CI, 30 - 48); followed by subtype 1a, 22% (95% CI, 15 - 30). Pooled summary estimates of the prevalence of HCV genotypes and subtypes in north African countries, including Egypt, Tunisia, Morocco, Libya, and Sudan, were shown in Appendix 4. In Tunisia, genotype 1 was the predominant genotype with a rate of 75% (95% CI, 57 - 94); followed by genotype 4, 22% (95% CI, 5 - 39). Subtype 1b was the most common subtype in Tunisia with a rate of 69% (95% CI, 50 - 88). In Egypt, genotype 4 was the most common genotype with a rate of 69% (95% CI, 36 - 100); followed by genotype 1, 5% (95% CI, 3 - 7). Subtype 4a was the most prevalent subtype with a rate of 59% (95% CI, 35 - 83); followed by subtype 1b, 3% (95% CI, 1 - 5). In Libya, genotype 4 and genotype 1 account for 32% (95% CI, 26 - 39); and 32% (95% CI, 30 - 34) of the pooled estimate of the HCV genotype rate, respectively, and were the predominant genotypes. There was no data about HCV subtypes in published studies from Libya. In Morocco, genotype 1 was the most prevalent genotype with a rate of 55% (95% CI, 41 - 69); followed by genotype 2, 26% (95% CI, 17 - 34). Subtype 1b was the most common subtype in Morocco with a rate of 32% (95% CI, 7 - 56). A study in 176 Sudanese patients with hepatosplenic schistosomiasis revealed genotype 4 as a major HCV genotype. Pooled summary estimates of the prevalence of HCV genotypes and subtypes in Middle East Arab countries, including Saudi Arabia, Iraq, Lebanon, Jordan, Bahrain, Kuwait, the United Arab Emirates, Palestinian, Qatar, and Syria, were shown in Appendix 5. In Jordan, genotype 1 and genotype 4 account for 52% (95% CI, 11 - 94); and 52% (95% CI, 24 - 79) of the pooled estimate of the HCV genotype rate, respectively, and were the predominant genotypes. In Saudi Arabia, genotype 4 was the most prevalent genotype with a rate of 65% (95% CI, 59 - 72); followed by genotype 1, 23% (95% CI, 15 - 30). There was no data about HCV subtypes in published studies from Saudi Arabia. In Iraq, genotype 1 was the most common genotype with a rate of 45% (95% CI, 23 - 67); followed by genotype 4, 32% (95% CI, 17 - 48). Subtype 1b was the predominant subtype with a rate of 23% (95% CI, 12 - 35); followed by subtype 1a, 15% (95% CI, 2 - 27). In Lebanon, genotype 1 was the most common genotype with a rate of 37% (95% CI, 26 - 47); followed by genotype 4, 33% (95% CI, 18 - 47). The most common HCV genotype in Bahrain was genotype 1 with an estimated pooled prevalence of 37% (95% CI, 30 - 43). Genotype 4 was the most common genotype in Kuwait with a rate of 43% (95% CI, 33 - 52); followed by genotype 1, 28% (95% CI, 21 - 34). The predominant genotype in the United Arab Emirates was genotype 1 with a rate of 38% (95% CI, 16 - 60); followed by genotype 4, 30% (95% CI, 1 - 61). A study among 92 Palestinian chronic-HCV-infected patients reported genotype 4 as a predominant genotype with a rate of 64% (95% CI, 54 - 74); followed by genotype 1, 28% (95% CI, 19 - 37). An investigation into 400 chronic-HCV-infected patients in Qatar revealed genotype 4 as the most common genotype with a rate of 64% (95% CI, 59 - 69); followed by genotype 1, 20% (95% CI, 15 - 24). A comprehensive study among 636 consecutive HCV-infected patients referred to eight major medical centers in Syria showed genotype 4 as the most prevalent genotype with a rate of 59% (95% CI, 55 - 63); followed by genotype 1, 28% (95% CI, 25 - 32); and genotype 5, 10% (95% CI, 8 - 12). The eastern Mediterranean regional office of the WHO comprises 22 countries, stretching from central Asia and the Middle East through north Africa, with a combined population of almost 583 million people. This region displays a heterogeneous distribution of HCV with at least 21.3 million HCV-infected patients (5). Determination of the most prevalent HCV genotypes in this region could be helpful to develop more effective treatment strategies against HCV infection. The present systematic review was conducted to shed more light on the distribution of HCV genotypes in EMRO countries. To determine HCV genotype prevalence in various countries, estimated pooled prevalence of HCV genotypes and subtypes were calculated for each of the EMRO countries. According to our results, genotype distribution of HCV takes diverse patterns in EMRO countries (Figure 2). In EMRO non-Arab countries (Iran, Pakistan and Afghanistan) genotypes 1 and 3 were predominant. In Iran, Subtype 1a was the most common subtype, followed by subtype 3a, which is similar to the HCV genotype distribution pattern in Northern Europe (12). In Pakistan subtype 3a was the most common subtype. There was only one report from Afghanistan, which showed predominance of subtype 3a, followed by subtype 1a (13). Due to war and political instability in Afghanistan, a tremendous number of Afghan immigrants usually make many trips between Iran, Afghanistan, and Pakistan (14), which may explain the HCV genotypes in Afghanistan. In the Middle East Arab countries genotypes 4 and 1 were predominant with two different distribution patterns; genotype 4 was the most common genotype in Saudi Arabia, Kuwait, Qatar, Syria, and Palestinian, while genotype 1 was found with higher frequency in Jordan, Lebanon, Iraq, Bahrain, and the United Arab Emirates. It should be noted that data from the Arabian Peninsula region has to be treated with caution due to the impact of foreign workers on HCV genotype prevalence. Furthermore, genotypes of HCV in North African Arab countries take two different distribution patterns; the first is limited to Nile river region (Egypt and Sudan) with genotype 4 being predominant, and the other pattern, which exists in the Maghreb region (Tunisia and Morocco), is characterized by the dominance of subtype 1b. Libya, in the Maghreb region, is the exception to this rule, as it shows a higher frequency of genotype 4 compared with Tunisia and Morocco. It is plausible that the Egyptian epidemic may have affected the HCV genotype distribution pattern in Libya, which is the neighboring country to the west of Egypt. Combination therapy with pegIFNα-2a and ribavirin is the most commonly available standard treatment protocol in EMRO countries, and the use of new direct-acting antiviral agents is not routine in most of the countries in this region. The clinical significance of HCV genotype distribution in EMRO countries is based on the impact of genotype on response to the standard treatment of pegIFNα-2a and ribavirin. The most common genotypes in EMRO countries, according to our results (genotypes 4 and 1) were also considered the most difficult to treat (8). A proportion of HCV in EMRO countries’ patients was reported as untypeable. Untypeable genotypes represent HCV types other than those identified by the genotyping system, or a low viral gene copy number, which can escape genotype recognition. In order to recognize untypeable HCV genotypes, it is necessary to perform viral genome sequencing and phylogenetic analysis. In addition, mixed infections with different HCV genotypes can occur, and may lead to severe disease; low response rates to antiviral therapy increases the likelihood of relapse (15). Prevalence of infection with multiple HCV genotypes is variable between different countries in the EMRO region, and ranges from 0.3 in Iran to 0.13 in Iraq. A number of limitations exist in the current study that should be noted. First, the sample size for some of the EMRO countries may not be adequate to produce a reliable estimate. Second, different HCV genotyping methods were utilized by various investigations, which may affect the obtained results of the present meta-analysis. Third, there is heterogeneity among the studies in terms of HCV-infected populations and patients’ risk groups, which makes the results more difficult to interpret. Furthermore, data deficiencies exist in some studies which did not allow for their analysis. Taken together, the current study showed diverse patterns of HCV genotype distribution in EMRO countries. Genotypes 1 and 3 were predominant in Iran and Pakistan, while genotype 4 and 1 were the most common genotypes in the Middle East Arab countries and north African Arab countries. The most resistant types to treatment (genotypes 4 and 1) are found more commonly in EMRO countries, and greater effort is required to augment the treatment plans and strategies. The authors would like to thank the staff of the Baqiyatallah Research Center for gastroenterology and liver diseases. Authors’ Contribution: The authors declare that they have no conflicts of interest. Funding/Support: This study is supported by the Baqiyatallah research center for gastroenterology and liver diseases.